My mom recently sent me a bunch of photos from our family album taken when I was just a kid. I’ve posted a few of them up on Flickr and will keep adding to the set as I find time to process them. 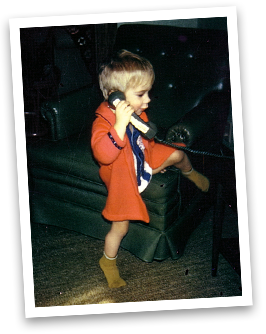 This particular one of me stood out for a bunch of reasons, but mainly I’m drawn to the big pea green chair and matching phone receiver. I remember my parents loved this color when I was a kid and it was all over our house. This could be why I have an aversion to peas today. Also note the big sticker on the phone’s handset. You might remember this from your childhood as well. People used to apply these on their phones so they could quickly reference important numbers like the police, fire department and poison control. Ah, the days before speed dialing and 9-1-1. Gets me all choked up sometimes. Watch for more Maheux family photos soon.